11-3-2011 Time for Rune Ore! As you can see my Goal is to Make Max Gp!!! I thought as making this account to be a Merchanting Clan cc but now I have decided not to do that. I might buy items that other Free to Play merchants are doing. I will try to log on 2 times a day to check Ge offers. Edited by Matt258, 28 May 2017 - 2:49 PM. I'm not a thief, I'm a treasure hunter. Very very nice account. It looks like you've been playing for awhile haha. It's cool that you still have all of those old screenshots, especially the ones of you ranked first. Best of luck with your goals on your other two accounts. Very nice how much would that cost to get all those grapes? Or you want them for free? Very ambitious goal, especially when you are such a low level now. I wish you good luck. Also I think I missed the point of your video. All I saw was you standing at the GE for 2 minutes doing nothing. 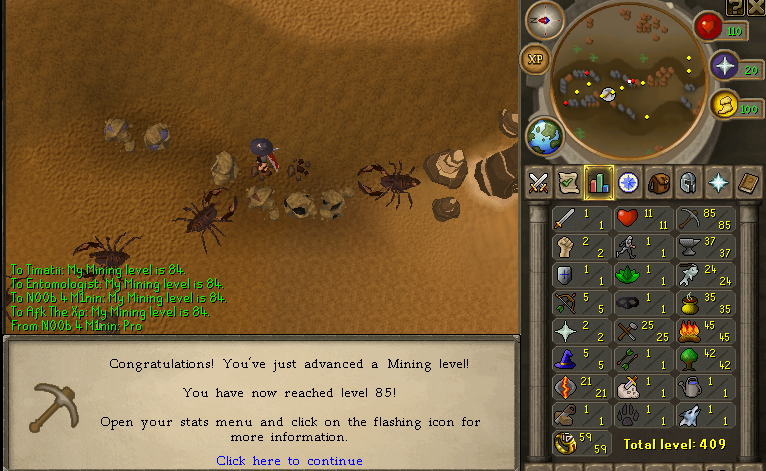 Working towards 99 Slayer and 99 Farming. Very slowly. Crazy goal but none the less exciting and interesting. Good luck on your goals! Thanks :) Yeah I have A LOT (2k) of pictures that I need to upload someday. I would like to get the Grapes and Jugs of water for Free then I would pay back after I get 200M exp. The Grapes would be like 350M. Of course I enjoy the crazy Goals! Thanks! I showed my Skills & the exp I have in Cooking. I showed how to make a Wine. Indeed it is a crazy Goal :) Thanks! Thanks! It will take a long time to get all of the Jugs of water & Grapes since I'd like to start when I have it banked! Why would you do this? It will be incredibly boring, a waste of time and if someone was to look you up on highscores they wouldn't know if you did it by p2p or f2p means. I honestly cant see this lasting longer than 60 cooking or so. By the time you have 200m exp by making wines , you could have learnt the piano, learnt a foriegn language, or even maxed out your account somewhat. To Mod: This isn't flame, so don't delete this post. This is a Goal I made before I got 200m exp on Matt258. They could pm me asking if I did it on F2p. I will make a video showing I have only been F2p. Want to bet 400M gp? I know Spanish. The piano is fun.Learn to spell check :) That is flaming post! I saw you zmi'ing today on matt258, looked you up, saw ranks/total exp, was surprised lol. Two crazy goals there bro. Although, seeing as you've done 3 200m's already, i wouldn't be suprised if you don't pull both goals off. Now dont pull all the fast nolifer crap on us. Good luck with your goals! Nice achievements you got in the past Those pictures bring back memories of the amazing old scape :-DHow much will it cost you to make 1 mill wines? Well, I looked up on the GE, and if he was to buy 1mil grapes and 1mil jugs, it would cost approximately 400 mil. Judging from your past achievements I have no doubt at all that you can do it! Why did you write this post? You could have learnt how to say "butter" in Japanese! On topic: Interesting goal. Getting to maximum cash on f2p is going to take way more effort than on p2p, even by flipping. Thanks! Yeah I have a lot of pictures (2k) that I need to upload someday. It would cost about 400M. I'm asking for anyone could help me get the Grapes or Jugs of water then I would pauy them back after I get 200M exp. Yeah I thought about saying something back to him Yeah, getting Max Gp on F2p is a lot harder since there aren't a lot of items to buy. I'm just buying an item that's 2 gp each profit so I don't have to log in everyday but I do like to log on to collect it everyday. Hey Makin Wines, good looking thread you got here, and some great goals you have as well! You've already got me added in game, best of luck to you man. Not to put you down but, I'd be surprised if you made it to 99. However, good luck on 200m. Don't run when you lose, don't whine when it hurts. well I saw you already completed 200m cooking and I was wondering why you'd want to do it on a skiller, but by now I know you have unique goals (can collections etc.) and I wish you luck. Do you plan on getting all 1m jugs first before making the wines?